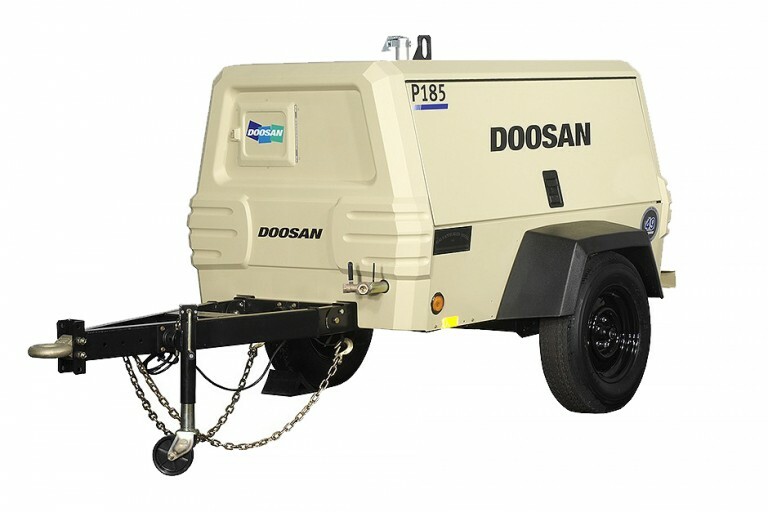 Powered by a Tier 4 Final-compliant Doosan engine, the P185WDO portable air compressor meets the needs of a variety of applications, from powering handheld air tools, to sandblasting, sprinkler and irrigation line blow-out, cable laying and pipeline testing. Spin-on oil separation system for the easiest maintenance in the industry. Rear access panel for cleaning heat exchangers. Equipped with easy to read, five-inch high visibility LED backlit gauges, a digital screen and durable push buttons for engine start and other key control functions. Extended run time thanks to the 49HP rated effi cient fuel sipping Doosan engine. DOC (Diesel Oxidation Catalyst) engine after treatment to provide you with a maintenance-free solution for tier 4 final emissions. The industry’s largest and deepest, full-length toolbox providing over 8,700 cubic inches of convenient tool and accessory storage. Classic, legendary design and features of our premium compressors provides you with a variety of configurations to suit your needs. Robust frame and drawbar coupled with 15 inch wheels and an independent rubber torsion suspension provides excellent ground clearance, stability and mobility on and off the road.